We enjoyed this bright tasty salad this evening as part of our dinner meal. 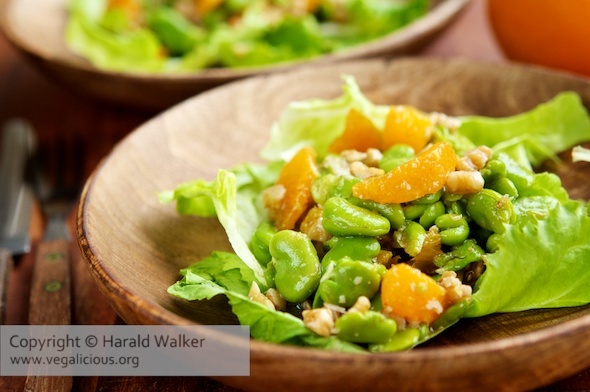 The combination of orange with the favas and walnuts is very nice, and was especially enhanced by the dressing with mustard and sesame oil. Blanch the fava beans and remove their skins. Chop the walnuts and add to the fava beans. Remove the peel from the oranges and cut the sections from the orange. Cut each section in half. Add the orange pieces to the beans and walnuts. Make the salad dressing by combining the ingredients. Add a bit to the salad and ix lightly, reserving the rest of the salad dressing to be served individually at the table. We enjoyed this tasty salad on a bed of iceberg lettuce. 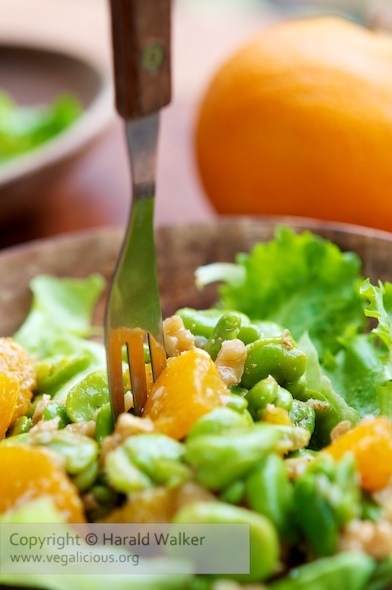 If fava beans are not available, you could substitute lima beans or edamame. Posted by Chris Walker on April 6, 2011 in Beans, Orange, Salads, Walnut.